IPL 2019: Will CSK beat DC in their backyard? IPL 2019: Lightning nearly struck Kotla! MS Dhoni was at it again behind the stumps, showing his speed. It was speedy and Delhi captain Shreyas Iyer survived it by a whisker. It was the first over from Ravindra Jadeja where he forced Iyer to come on the front foot, he came as the ball spun and missed the outside edge. Dhoni was quick as ever as he took the bails off. The leg umpire went upstairs to get a proper look at things. Dhoni looked confident, but for a change, the decision did not come in his favour as some part of the foot was grounded when the bails were taken off. Iyer survived a stumping. 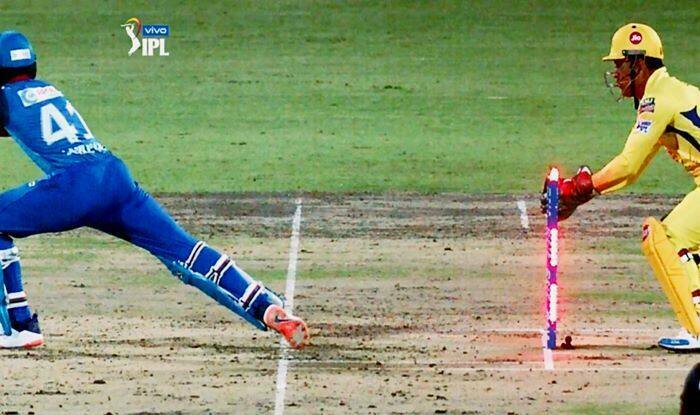 His foot was in the air for a fraction of a second when Dhoni whipped the bails off. At the time of filing the copy, Dhawan was looking set for a fifty as he has Pant for company who is in red-hot form. The Capitals are 119/2 in 15 overs.